To name tag every item with style! This self-sealing (just press and stick) rectangular and plasticized name label is perfect to tag and identify objects like bag-backs, notebooks, pencil cases, mobile game devices, DVDs and CDs... Ideal to hide bar code on cultural goods like books, games boxes... 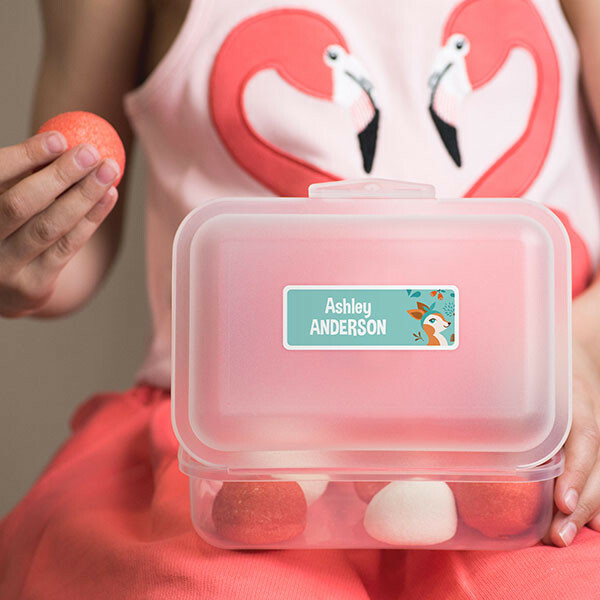 This colorful name stickers will bring a decorative touch to everything you own with a wide range of original home-made designs or famous illustrations (Disney, Pixar, Hello Kitty). This stylish rectangle stickers are ideal to name any items in your party and ceremony (wedding, birthday, communion, bachelor party...) with the person name or the event name. It will also help you keep track of your child’s stuff. Choose your favorite design from our thousands of options! Our strength: unlike many stickers available online, our stickers are plasticized ensuring higher quality and exceptional durability. Thus, your text will never fade despite numerous bad treatments like friction, direct extended sunlight and water damage.